Good morning! 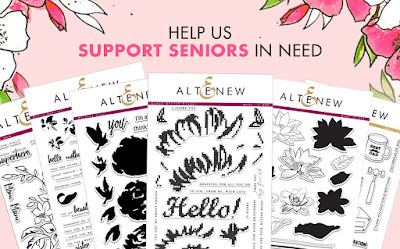 This morning I'm hopping along with Altenew to focus on their amazing Celebrating Parents Card Drive - collecting cards for those who are often forgotten this time of year on Mother's and Father's Day, in nursing homes or shelters. You can find all the info HERE on the Altenew Blog! There are some select items on sale that are perfect for creating cards for the card drive - as well as prizes up for grabs when you send cards in. AND...this blog hop today also has some prizes up for grabs! Keep reading for more details! I paired up some newer and older stamp sets to create my cards, and had lots of fun with watercolors to color my images or background in. 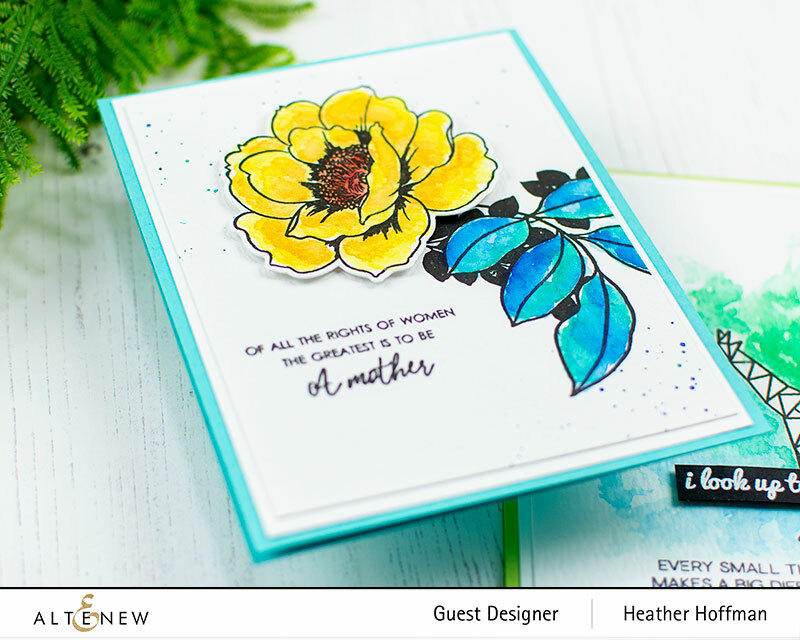 The Mother's Day one paired up the more recently released Wallpaper Art stamp set and Gift from Heaven stamp set for the sentiment. 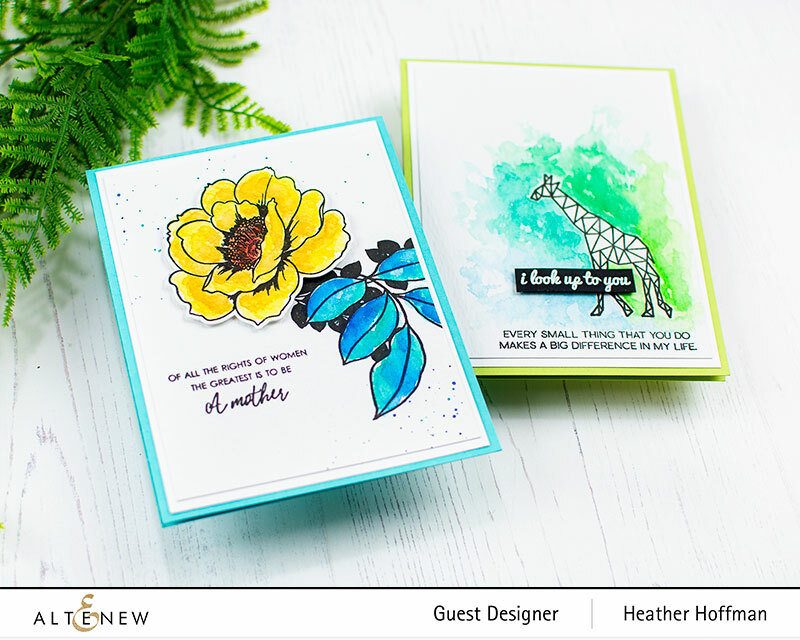 I stamped the leaf image and sentiment directly on the watercolor paper, then the flower I stamped on a separate panel of watercolor paper and colored and die cut with the Coordinating Dies. Once everything was colored and dried, I was able to pop it up on foam adhesive for a bit of dimension. For the Father's Day card, I stamped my image from the older and super fun set called Geometric Menagerie, and a sentiment underneath from Adore You which is actually a lovely floral set. I did some watercoloring around the image, leaving the image space white and clean. I then added a sentiment from Geometric Menagerie, heat embossed on a bit of black cardstock and popped up on foam adhesive. I matted both of the watercolor panels with some white cardstock, then mounted on coordinating solid cardstock card bases to finish them off! I hope you will join in on the fun for this great card drive! 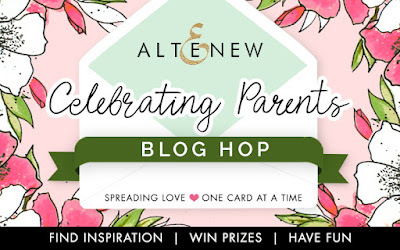 Altenew is giving away 6 $30 gift cards for comments left on the Altenew Card Blog. In addition, a $15 gift card up winner will be drawn at each stop along the hop! All winners will be announced on the Altenew blogs on 4/17/19. The sentiment I look up to you is lovely! Pretty cards. I love the flower! Wonderful cards and the sentiments are perfect. Beautiful cards and I love your bright, fresh colours. Wonderful card, technique (newer + older), and idea! Thanks! Love the brightness of your cards. Your water colouring skills are great. Thanks so much for sharing. Beautifull cards. 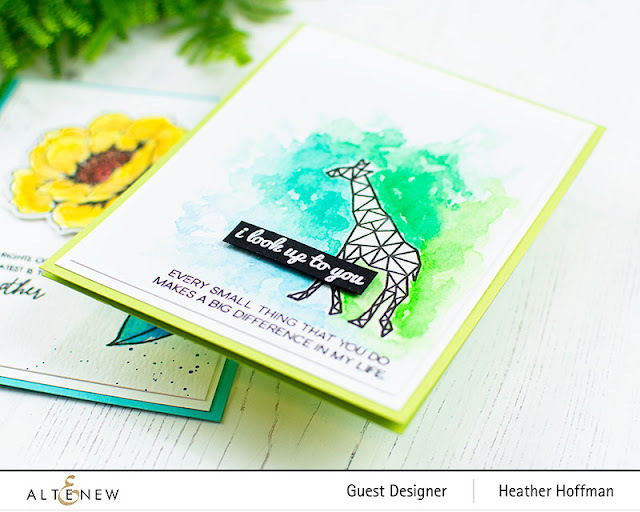 I especially love the background you created for the giraffe. It complements him perfectly. Thanks for the inspiration! Gorgeous backgrounds! I love the sentiments! Thank you for sharing your cards. TFS your cards, I often neglect my older stamps, thanks for reminding me to get them out and use them! Gorgeous cards.You're going to make someone's day happy! 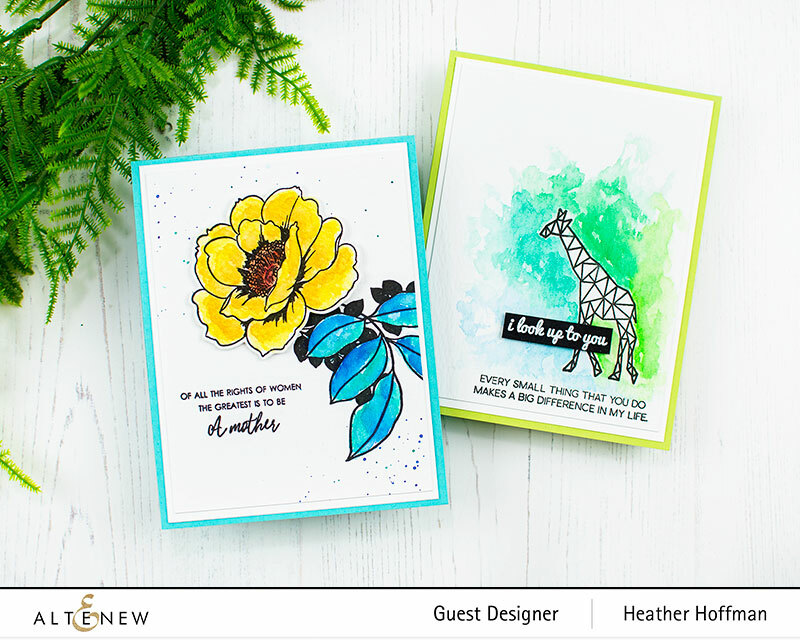 You did some beautiful watercoloring on these pretty cards! 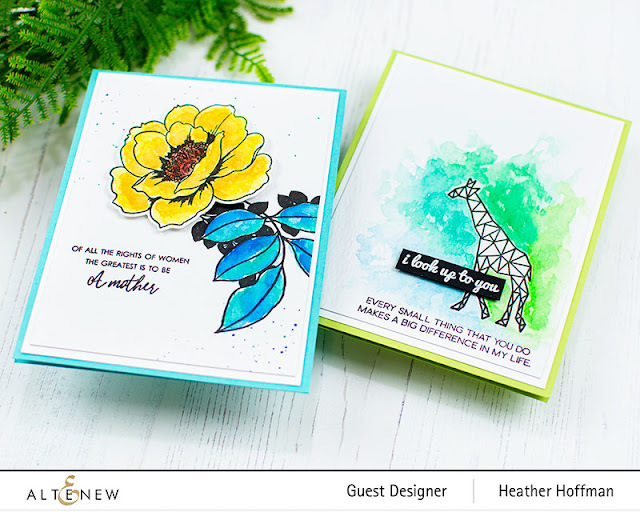 Love these two cards, Heather! Your watercolors are so pretty and the sentiments are perfect. These are fun, colorful, and perfect! Love the geometric giraffe. Great cards. Love your cards Heather! For the sentiment I am using Hope you are having a happy day on many of the cards I sent to the drive - can't go wrong with that, right? Very nice cards for a great cause. Love your water coloring. lovely cards Heather! love the colors and images you chose! thanks for the inspiration! Love the yellow flower, Heather. The zoo card is very cute! Love both the cards. They are gorgeous. It is great to see one of the older sets in use. I think many of them are classics. A giraffe is so whimsical. Great ideas and colors. I love the bright colors on your cards!! The giraffe is adorable!! What vibrant cards! They look so fun. Awesome job. Thanks for sharing your creativity! Love the wallpaper flower. It is one of my favorite stamps. I just can't catch it in stock. Your background for your giraffe is gorgeous! Wonderful and lovely cards. I like that background behind the giraffe and your Wallpaper Art flower card is very pretty. Love both cards - gorgeous! Thanks Heather and Altenew. 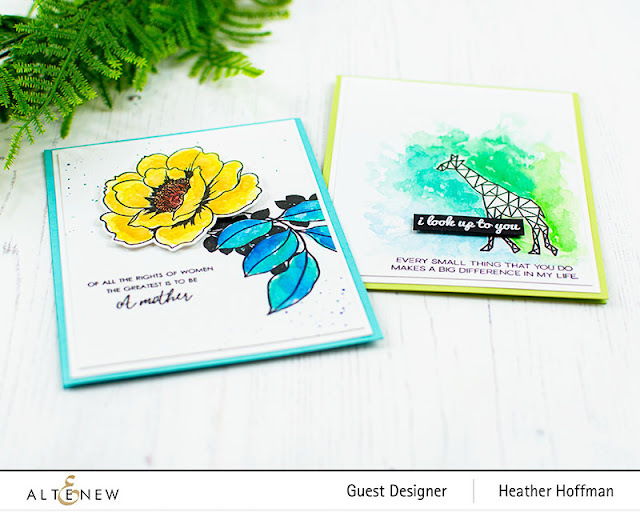 Your cards are lovely, and while I do agree that the giraffe one has a very specific sentiment, it would be easy to replicate with a more generic one for this card collection. Thank you for your inspiring talent!